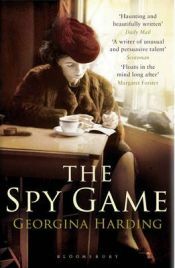 Georgina Harding’s “The Spy Game” is a quietly gripping read that is certainly reminiscent of William Boyd’s “Restless” but it is the author’s brilliant portrayal of the young Anna that really stands out and as a novel that uses for the most part a child narrator, this novel is, for me, right up there with classics such as “To Kill a Mockingbird”. The first section takes place in the 1960s and opens one autumn day when Anna’s mother drives off into the fog and never returns. It’s the middle of the Cold War and the very same day that Anna and her brother Peter learn of their mother’s death, a major spy story breaks in news. Peter, a couple of years older than Anna and with a boy’s fondness for thriller stories, refuses to accept that his mother is dead and confides in Anna that he believes that their mother was actually involved in espionage herself. Their father works for the government, their mother was a refugee from the east of Germany and the couple met in post-war Berlin: that their mother was a spy is completely obvious to Peter and, as their rather remote father prefers to seek solace among his flower beds, Peter has plenty of time to persuade Anna of the fact too. When we meet Anna again in the second half of the book she is a grown woman, fifty-something with a grown up daughter of her own. After the death of their father, Anna finally decides to head across Europe to try to find some answers to the questions that plagued her childhood and ultimately drove her brother away. This finely written story is a stylish and haunting evocation of a very precise point of the twentieth century. It was a time when middle England was rocked by revelations that spies were living in their quiet little communities; those exposed were regarded with sheer hatred by the majority of the public and with each new revelation, anyone who was slightly different was looked upon with some suspicion. Anna’s mother sticks out in their sleepy Oxfordshire village, with her glamorous appearance and her eastern European accent but it is not until her disappearance that the children ever really consider how different she was from other mothers. Peter is the driving force behind the childrens’ game; he uses his status as the older sibling to compel Anna to join in. While you can’t help but smile at the childrens’ skewed view of the world there is at the same time a tremendous sadness behind Peter’s unwavering belief that his mother was part of a Soviet spy ring. At first Harding appears to be taking a similar path to Michael Frayn in whose novel “Spies” a young boy becomes convinced that his best friend’s mother is a spy but the story subtly develops into something far deeper. At the heart of the novel is the village where the family live, and those people who live around them. The Laceys who are so good to Anna and Peter are former Japanese prisoners of war and although they don’t talk about their experiences themselves, there’s always a strong underlying feeling that they keep on a brave face in public. Even more poignant is Mrs Cahn, Anna’s piano teacher, a Jewish refugee; stuck in this tight little community, living alone, Mrs Cahn’s deterioration is plain for anyone to see but for the children who associate Mrs Cahn’s exotic European-ness with that of their mother, she too becomes another justification for peter’s theories. The novel has many strengths, not least the superb portrayal of the Russian city of Kaliningrad, and to a more modest extent the descriptions of current day Berlin, in the second part of the novel. Harding does a remarkable job of capturing not only the visual aspects of the city but the feeling of other worldiness that comes with the formerly closed Russian outposts, something I experienced myself when visiting the then recently re-opened Black Sea port of Sebastopol. But so too is 1960s rural England brilliantly depicted; London and other big cities may have been swinging but life in the countryside was quite different and Harding creates a stifled environment in which children were sent away to school and secrets were steadfastly kept. It is against this muted, stiff upper lip backdrop that Peter’s directness seems more shocking; that a child should be gravely affected by the death of his mother is hardly surprising but the way in which he becomes almost dangerously obsessed with his theories and brash in the way he tries to prove them sets him apart from those around him. For the main part “The Spy Game” is an immensely satisfying and meaty read though it is let down by a shaky ending which does not satisfy the story that has preceded it and raises new questions at quite the wrong time. It is however still a very worthwhile read, a fine combination of absorbing thriller with an interesting exploration of loss. No Comments on "The Spy Game"